Cook quinoa according to package directions, set aside. Heat oil in large skillet over high heat and sauté mushrooms until brown. Add onions and continue cooking until caramelized. Stir in pecans and black pepper, toss to combine and cook for 2-3 minutes. 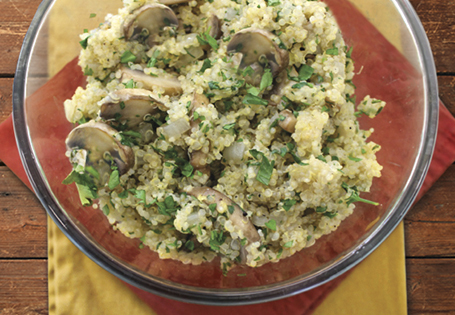 Stir mushroom onion mixture into quinoa, season with salt, pepper and lemon juice to taste. Sprinkle with lemon zest and parsley before serving.